The Feast of The Most Sacred Heart of Jesus is one of the most widely practiced and well-known devotions in the Roman Catholic Church. 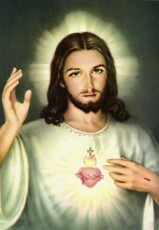 It takes the physical heart of Jesus as representation of His Divine love for humanity. The Feast of the Sacred Heart has been in the Roman Catholic Liturgical calendar since 1856, and is always celebrated 19 days after Pentecost Sunday. The feast of the Sacred Heart always falls on a Friday. The devotion especially emphasizes the unmitigated love, compassion, and long-suffering of the heart of Christ towards humanity. The origin of the devotion to the Most Sacred Heart in the modern form, derived for a French Roman Catholic Saint, St. Marguerite Marie Alacoque, whose feast day is October 16th. She learned the devotion from Jesus during a mystical experience. Her revelations were numerous. On December 27, 1673, Margaret Mary reported that Jesus permitted her to rest her head upon His heart, and then disclosed to her the wonders of his love, telling her that he desired to make them known to all mankind and to diffuse the treasures of his goodness, and that he had chosen her for this work. In July 1674, Jesus requested to be honored under the figure of His heart, also saying when He appeared radiant with love, He asked for a devotion of expiatory love, frequent reception of Holy Communion, especially Holy Communion on the First Friday of the month, and the Observance of Holy Hours. In the Roman Catholic tradition, devotion to the Most Sacred Heart of Jesus has been closely associated with Acts of Reparation to Jesus Christ. In his Encyclical, “Miserentissimus Redemptor”, Pope Pius XI stated, “The spirit of expiation or reparation has always had the first and foremost place in the worship given to the Most Sacred Heart of Jesus”. The “Golden Arrow Prayer” directly refers to the Sacred Heart.